Watermark,Resize,Add EXIF,Optimize Photos in a Single Workflow! Uses Automated Watermark Size Calculation Techniques to Scale the Watermarks to Match Selected Placement. Set a Common size for all output images or set the size of images individually.Easily Meet Web Standards. Design your own stylish watermark with Custom Text and Custom Logo and Apply to your Images with a Click.Brand your Photos Easily. Improve the Quality of your Photos before they are watermarked by using various Image Optimization Effects Provided. The Effects can be applied to your images individually before watermarking. Optionally add EXIF Information like Copyright,Comments,Author etc to all Watermarked Images. Crop out the Desired Portion from an Image and use it as the Watermark.Also allows you to Resize and Rotate Images. Direct Connectivity to Picasa so that you can directly Upload watermarked images to your Picasa Web Album after Watermarking. You can add photos to existing albums or create new Albums with Custom Properties. Upload Images Directly to your Flickr Galleries after watermarking with few clicks.You just need to authorize Mass Watermark once.This allows easy and seamless protection of your Flickr Photos. Packs all Processed Images to a Single Zip File. The Images will be the Final Output which may be Resized/Optimized. Ideal for Upload to Websites via FTP and Unzipping at the Website Side. Mass Watermark is Designed to make your Post Processing Workflow Easy and Efficient.The Powerful and Easy to Use User Interface allows you to Quickly Watermark 100s of Photos with Minimal Effort. 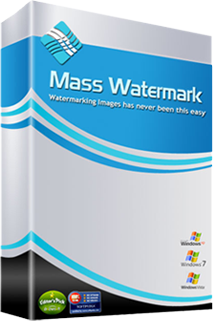 Mass Watermark is Powerful,Easy to Use and Fast. The well laid out UI is both Easy to use and Powerful. Watermarking,Resizing,Adding EXIF,Optimizing,Upload to Picasa/Flickr is Integrated in a Single Workflow. 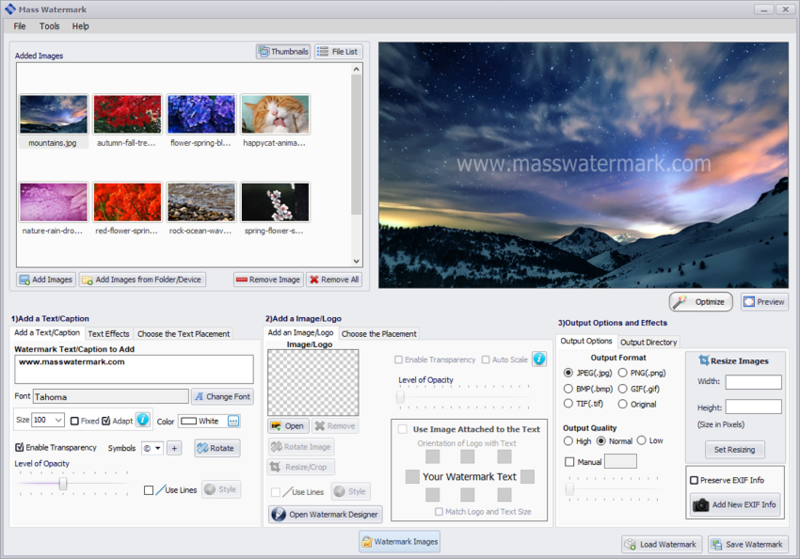 Mass Watermark is available for both Windows and OSX Operating Systems. Optionally add EXIF Data to your Images.